Consumers wish and expect more features, better content, deeper social integration, and even geo-sensitive applications from digital tablet publications. They want an immersive, interactive experience that takes full advantage of tablet functionality, not just content. They want and need to do more than what’s offered today. 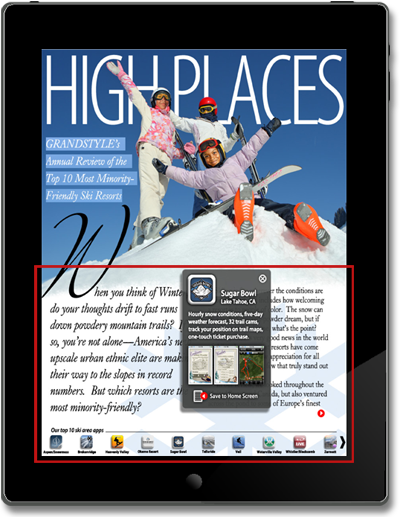 T-ZINE MEDIA’s powerful publishing content tool, designed for building and launching entirely new digital content for tablet devices, combines traditional written text, graphics, photography, and video with “apps” to introduce a new form of storytelling. It’s a sophisticated tool that creates rich, interactive content that focuses on reader engagement with the inclusion of third party “apps” and leverages today’s social platforms. Actionable data across every dimension of a reader experience is integrated to help build and grow audiences and to enable marketers to design ads that take full advantage of mobile tablet functionality. This makes ads more entertaining, informative and engaging, and connects passionate niche audiences directly with a marketer’s products and services, thus creating real value for both marketers and readers. 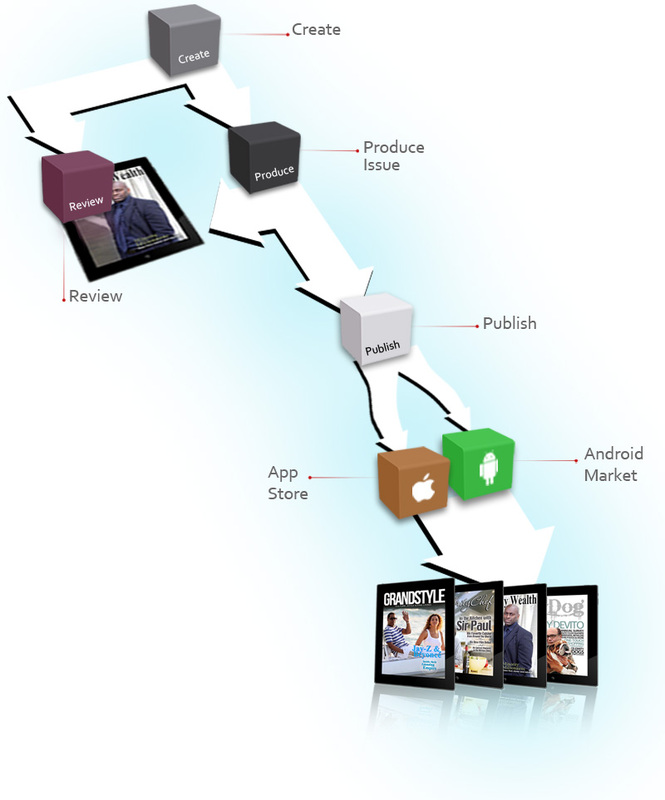 This example article illustrates the simple integration of “apps” to enhance an article. Third-party apps related to article are selected and integrated, providing readers with enhanced content experiences. Nearly every article will have some fantastic digital extra from inclusion of apps to all of the social instruments out today. Our brands not only deliver and provide insightful and pertinent original high-quality content and information, but they allow for reader interaction. This interaction is as simple as asking for comments, voting on an article, or recommending movies based on the ratings of other members with similar interests. The second page of example article illustrates more integrated approach of including “Apps” in editorial content. Reader taps red control and is fully engaged in a virtual tour utilizing full functionality of tablet devices. 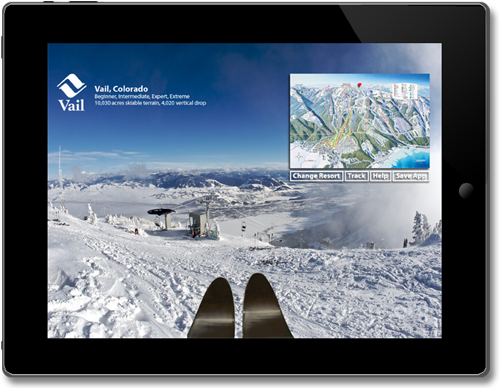 By clicking red control on previous page reader sees full view of ski area. 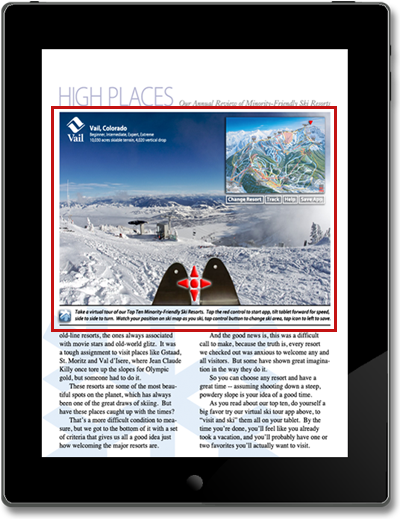 Tilts tablet forward for speed, side to side to turn, can view position on ski map, change ski area, or tap Save App icon to save to personal library. Inclusion of “Apps” provides members with vibrant, highly interactive content and takes full advantage of mobile tablet devices. It’s endless how integration of Apps will be used to enhancing editorial content and engage readers. The hook here is that, as the reader plays, they can earn a “gift card,” which is really a coupon to drive foot traffic to the nearest Target location. This ad is even more compelling because users are able to save the ad to their library, allowing Target to grow its user base, change the game to prompt on-going usage, or re-skin the game to reflect season. 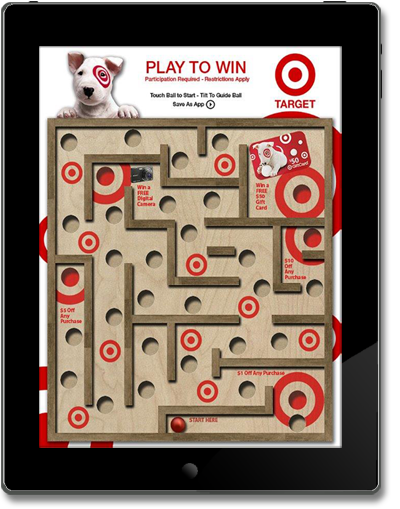 This provides added value to users and on-going engagement for Target with a passionate niche audience.